On our way back to Ulster during our first trip to France with Young People from the Shankill and Falls Road areas of Belfast and from Tallaght and Inchicore in Dublin, during the height of The Troubles, I asked the group to make a detour to the Ulster Memorial Tower to explain the part played by Irishmen of all persuasions in the First World War in France, Belgium and the Dardanelles. From what became our Farset Somme Project developed the idea of a Somme Association, which was to be supported by an international organisation, Friends of the Somme. [iii] This Association took root at a press conference held under the auspices of the then Lady Mayoress, Rhonda Paisley, on the 70th Anniversary of the Battle of the Somme, 1 July, 1986, when a Somme Commemoration Committee was initiated. The Ulster Memorial Tower stands on what was the German front line during the Battle of the Somme, July to November 1916. It is opposite Thiepval Wood from where the 36th(Ulster) Division made its historic charge on the 1st July 1916 and is in close proximity to the village of Thiepval. The Tower stands 70 feet tall and is a lasting tribute to the men of Ulster who gave their lives during the First World War. Its position on the battlefield is a permanent reminder of the 36th (Ulster) Division’s heroic charge at the Battle of the Somme on the opening day of that great offensive. The Ulster Tower was the first official memorial to be erected on the Western Front and was dedicated on 19th November 1921. The Tower itself is a replica of our well known Ulster landmark, Helen’s Tower, which stands on the Dufferin and Ava Estate at Clandeboye, County Down. As a result we were able to employ a Supervisor, David Campbell, for our Farset Somme Project, under our General Manager, Jackie Hewitt. At a meeting of Farset on Thursday 8th December,1988, David was able to report that a Press Conference for the Somme Project had been held in the Royal Ulster Rifles Museum, Waring Street, Belfast, under the auspices of Lt-Colonel WRH Charley on Tuesday 21st June, 1988. 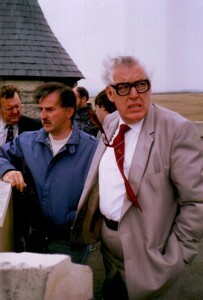 Rev Dr Ian Paisley and the then Lord Mayor of Belfast Councillor Nigel Dodds had attended, announcing the re-opening of the Ulster Tower at Thiepval. This had been formally performed by the Lord Mayor following a service of Commemoration at the Tower on Friday 1st July,1988. Dr Paisley announced that the Department of Finance had agreed to meet the cost of interior renovations at the Tower, A video presentation and photographic then took place inside the Tower. As Chairman I thanked all those involved in the proceedings including the local representatives from throughout Northern Ireland. As founding Chairman of the Somme Association, I have travelled to France and Belgium every year since its inception to remember the ordinary soldiers from throughout Ireland who fought and died there. Prince Richard has accompanied us many times, officiating at our ceremonies of Remembrance in both France and Gallipoli, and meeting with President Mary McAleese in Turkey. In commemorating the 90th anniversary of the end of the First World War in 2008, I was especially privileged to attend three Services of Remembrance in Belgium and France. The first took place on Sunday 29 June at the memorial at Wytschaete (Belgium) for the 16th (Irish) Division, the largely Roman Catholic and Nationalist division that had fought there alongside the largely Loyalist 36th (Ulster) Division at the Battle of Messines in June 1917.